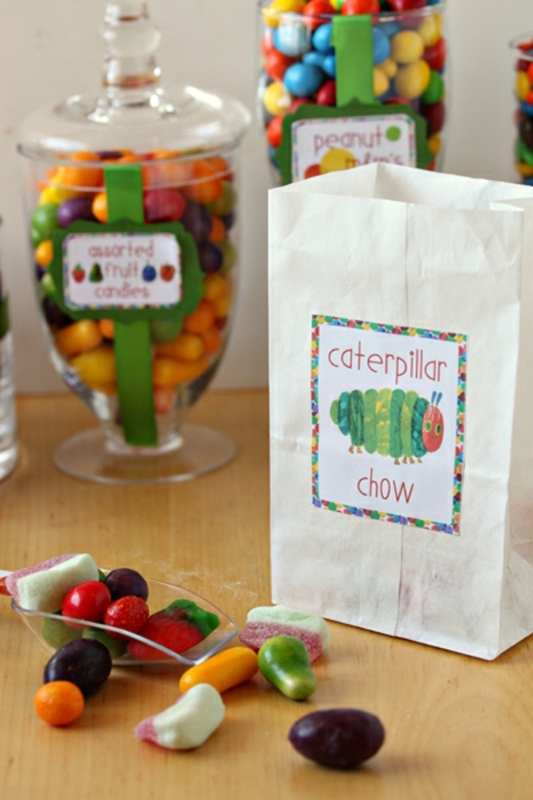 Recently my son turned one, and we threw him a party based on the book The Very Hungry Caterpillar. 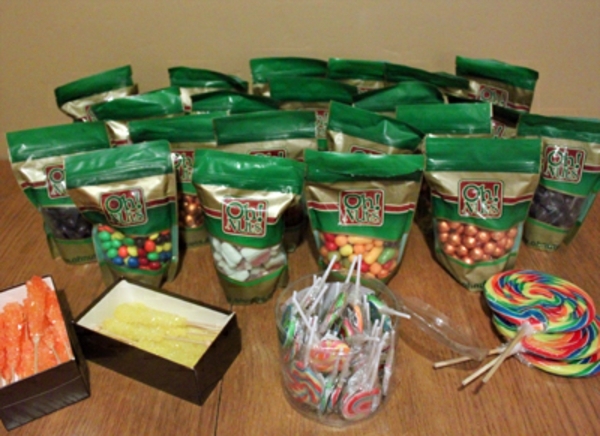 The highlight of the party was an epic candy buffet, featuring a dozen different candies from OhNuts.com. 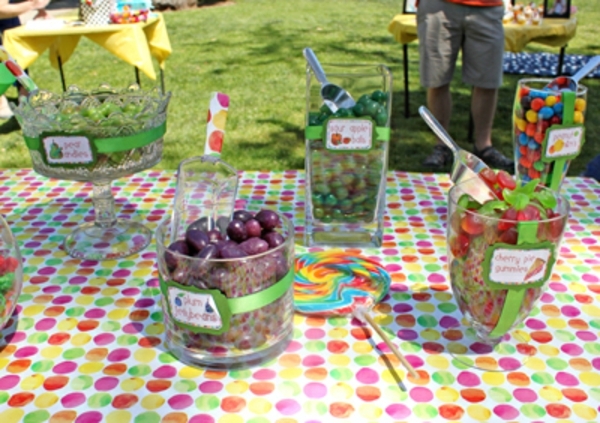 In this post I’ll share tips for how you can make your own birthday party candy buffet, as well as provide specific details on how we created our Very Hungry Caterpillar candy buffet. 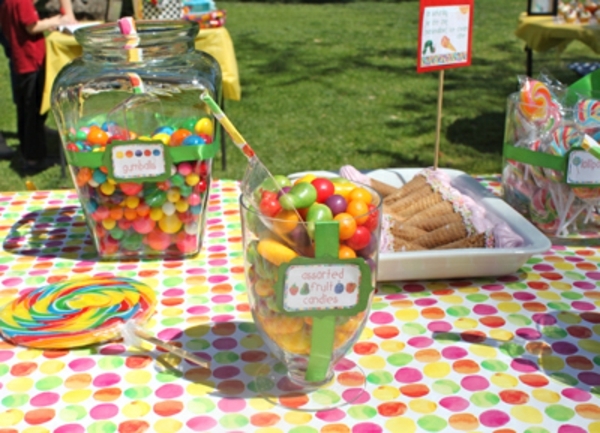 My theme came from a children’s book, but your theme could be anything–a color, a pattern, a season, even a specific type of candy. 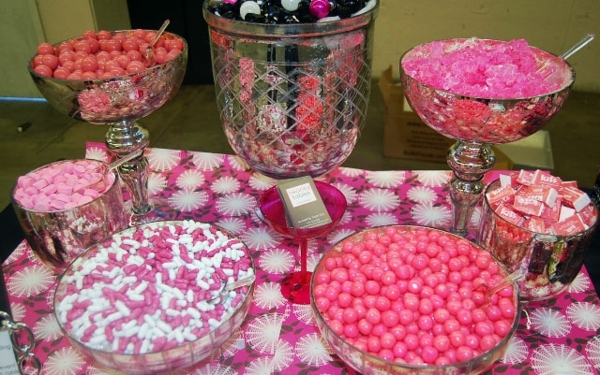 Having a theme unifies the candy and makes the table look cohesive. 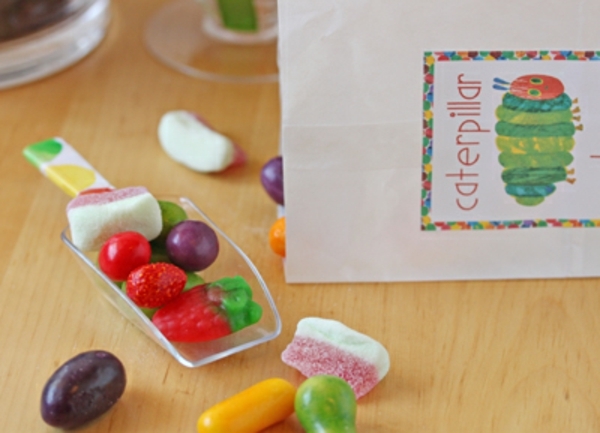 Since my theme was The Very Hungry Caterpillar, I wanted to accomplish two things: have bright, colorful candies that reflected the spirit and illustrations of the book, and have candies that referenced the food in the book. So not only were the candies I chose a rainbow of colors, but almost all of them were based on a fruit mentioned in the book. 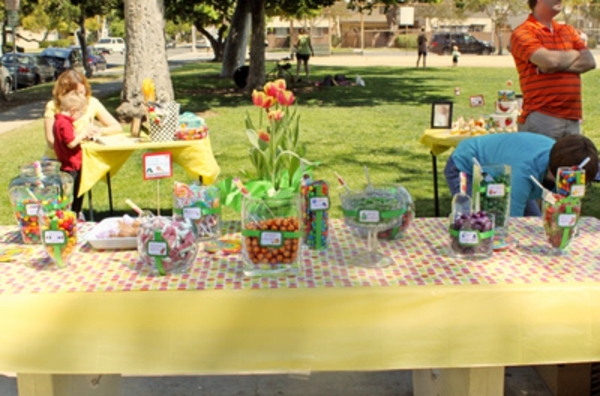 My party was fairy casual–it was picnic-style at a nearby park, and the candy buffet was available to guests throughout the whole party. Since the setting was so low-key, I didn’t want the buffet to be too precious or styled. 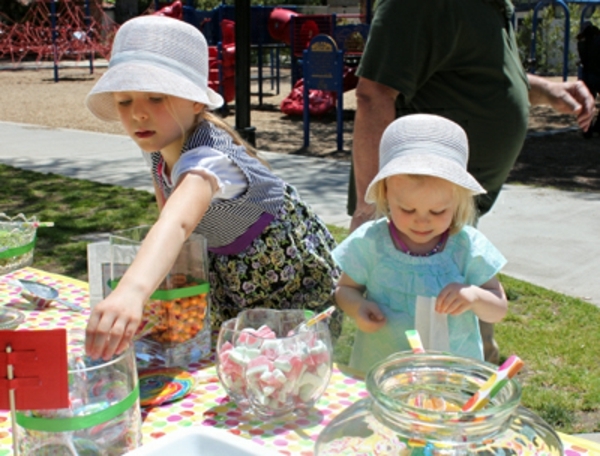 Plus, since children would be serving themselves, the set-up had to be fairly child-friendly. 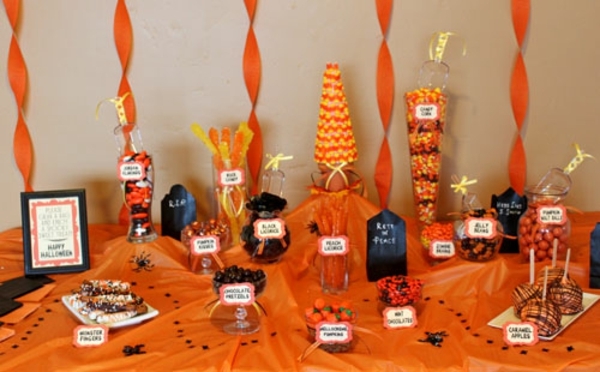 Candy buffets with towering glass goblets and tiered trays can be gorgeous, but they’re not the most practical choice when small children are involved! First, of course, you’ll need candy. 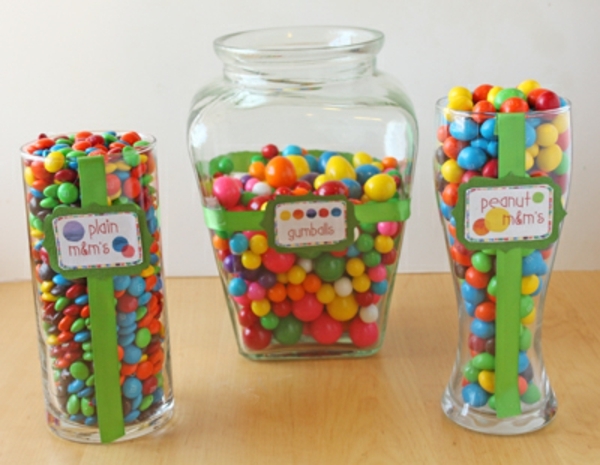 The amount you need depends on how many guests you have, how much candy you think they’ll eat, and also on the containers you use. A good rule of thumb is to estimate one-third to one-half of a pound per person (so one pound will be good for two-three people). 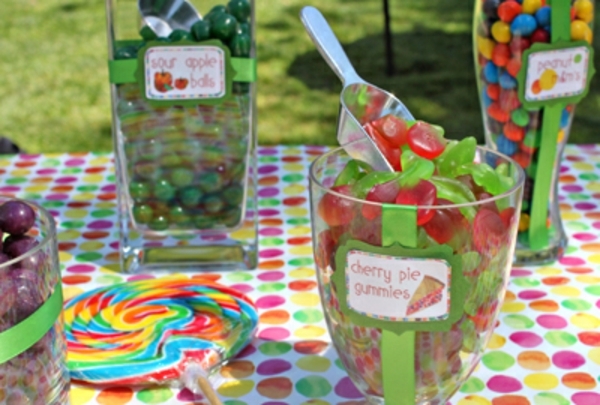 If you know that your guests will be enthusiastic candy eaters, or if you’ve purchased really large containers, you may want to buy more so that the buffet looks generous and full. 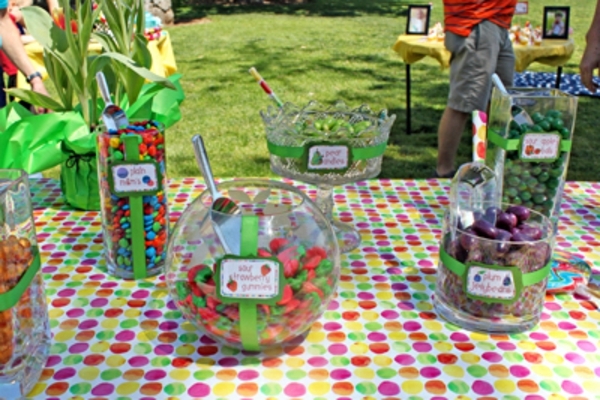 To keep things sanitary, you’ll want to provide candy scoops or other serving implements. I found clear plastic ones at the 99-cent store, and decorated the handles with paper to match our table decorations. 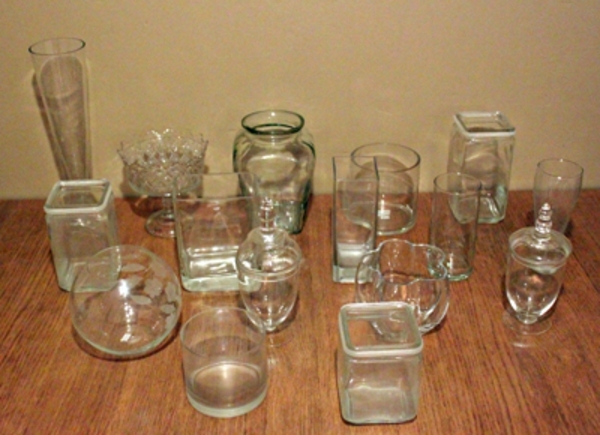 I also found some slightly nicer metal ones at Bed Bath & Beyond, and many websites also sell scoops. 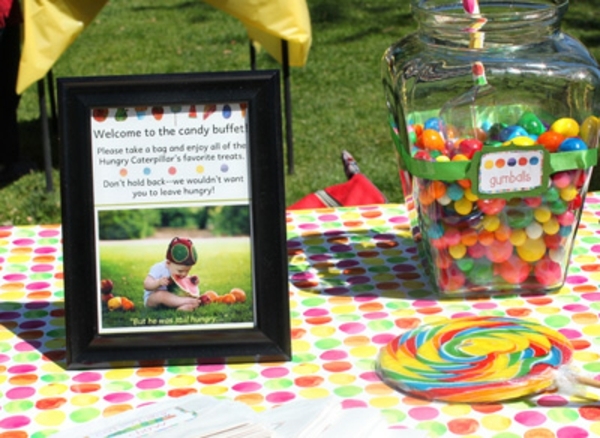 Think about the environment of your candy buffet. Will the day be humid? Consider buying individually-wrapped candies and chocolates that won’t stick together. Will it be hot? 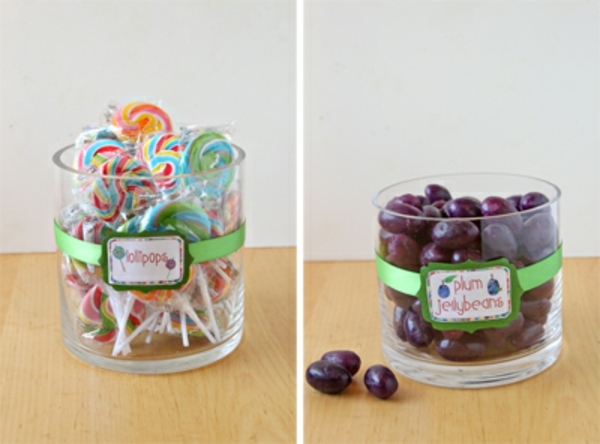 Opt for hard candies that won’t melt, instead of soft gummies or chocolates. 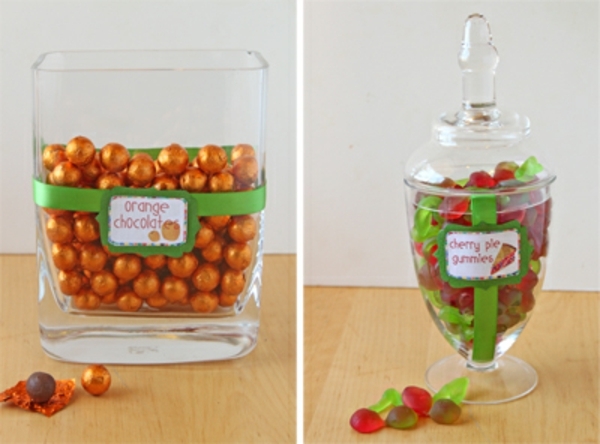 You probably don’t want your guests to have to stuff the candy in their pockets, so you’ll want to provide cute bags or containers for taking home the loot. I used small plain white bags, known as “2 pound” size. I bought mine at Smart & Final, but you can also find them online. Another good option is to use “merchandise bags,” which are flat paper bags. You can actually run those through your printer, so you can easily and cheaply customize them at home. 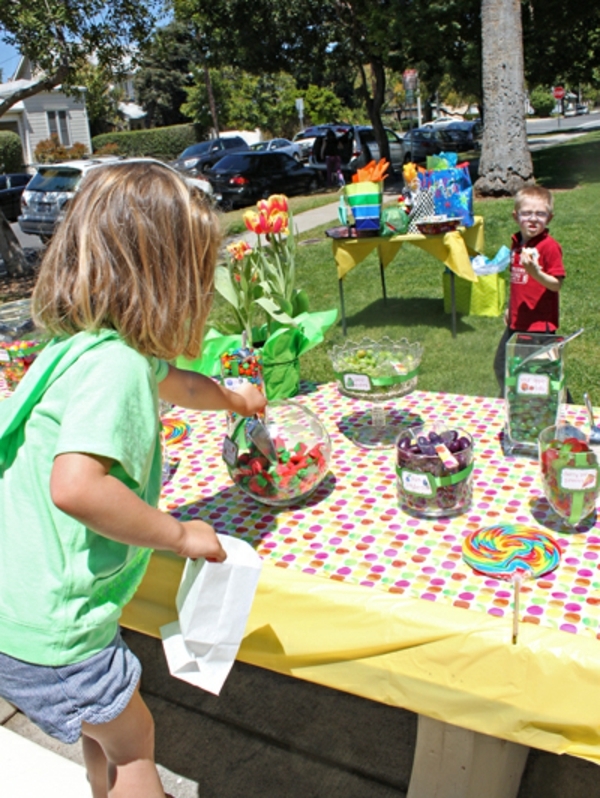 Keep in mind that the bigger the bag, the more candy guests are likely to take, and size accordingly. I customized my bags with labels that I designed and printed out on full-page label sheets. All I had to do was cut them apart and they were ready to stick on! Labels are a must! 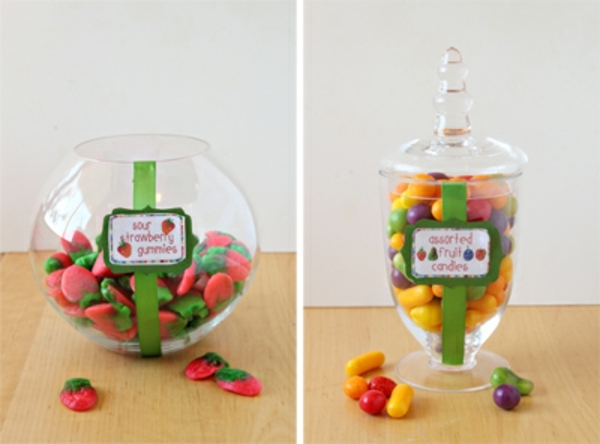 Not only do they look cute, but they help your guests navigate the buffet and choose candies they like–and avoid ones they don’t. In this age of food allergies, it’s also a good precaution to make sure your guests know exactly what they’re eating. 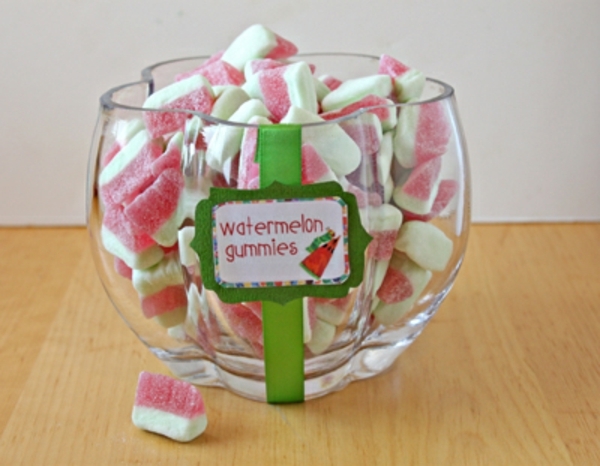 Not only did I label the type and flavor of the candy, but I also made sure to label candies that tasted sour, since I wasn’t sure if everyone would enjoy sour flavors. 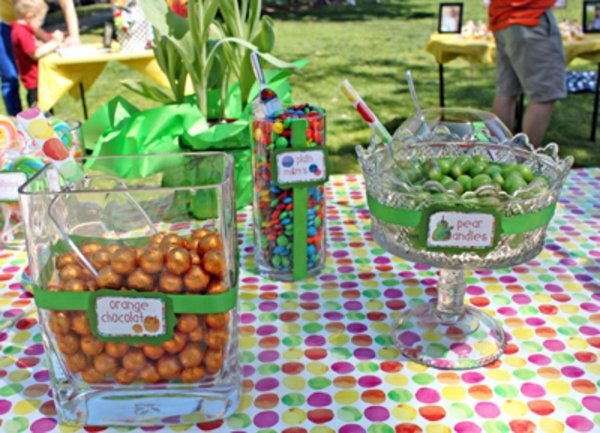 Here’s a breakdown of the specific candies I used for our candy buffet, plus links to where you can buy them on the OhNuts.com website. 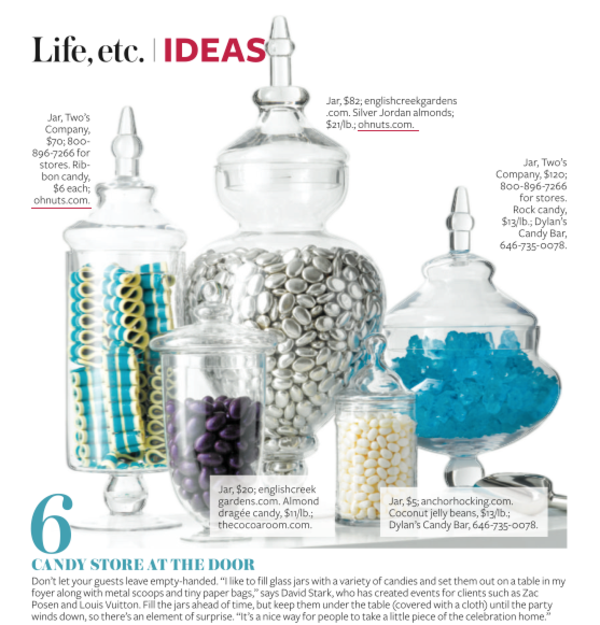 The candies you choose might be different, but I hope this inspires you and gives you an idea of the variety and fun you can have with your candy choices! 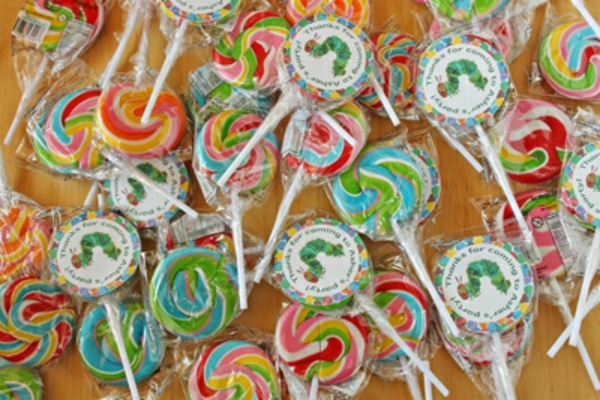 As a side note, I thought these 2″ swirl lollipops were absolutely perfect. 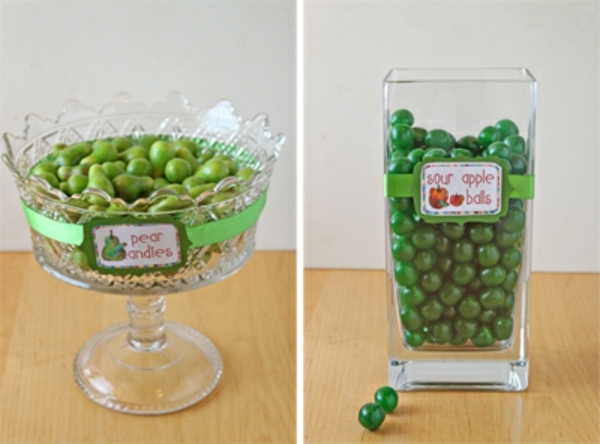 The looked cute, and they were the exact right size to fit with a 2″ round label. I stuck a thank-you label on some of the pops and put them in the goody bags for the children. Finally, I chose an assortment of colorful rainbow candy, like large gumballs, mini gumballs, plain m&ms, and peanut m&ms and give it more variety and color.